1. Ability to better attract new business by providing assurances of your superiority to prospects. 2. Provide the same assurance to existing customers, so they know it was the norm not a fluke that they were ultra-satisfied. 3. Bask in a coveted high rating from a third-party-credible independent research and news organization. 4. Motivate and incentivize employees to share in the pride of your traditions of service and carry them forward daily. 5. Improve crucial online Search Engine Optimization (SEO) and brand recognition. The award gives your company a distinct advantage over its competitors. 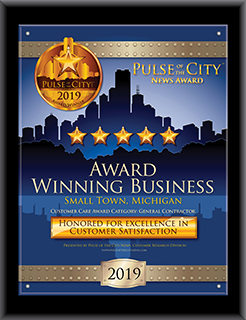 Achieve even higher levels of success by using your award as recommended on this site and by contacting your marketing consultant at Pulse at 866-732-9500 or customercare@PulseoftheCityNews.com. Leaving your award alone on the shelf still makes you an award winner, but without your active engagement highlighting your exclusive status, your inaction causes you to forego much of the potential benefit of the award. The only way you can take advantage of these benefits is to promote your award and start using it.